I discovered earlier that we cannot flag offensive comments from the mobile version of the site. You can flag comments by switching to the full site, but this definitely took some figuring out. We should be able to easily flag offensive material regardless which version of the site we're using. You can switch to full site mode (which is responsive now on Stack Overflow and some other sites in the network) with a link in the footer. That mode is eventually going to replace the mobile web version we currently have; any new developments on the current mobile version are unlikely. In the full site mode, the gray flags works just like they would on your computer. Not the answer you're looking for? 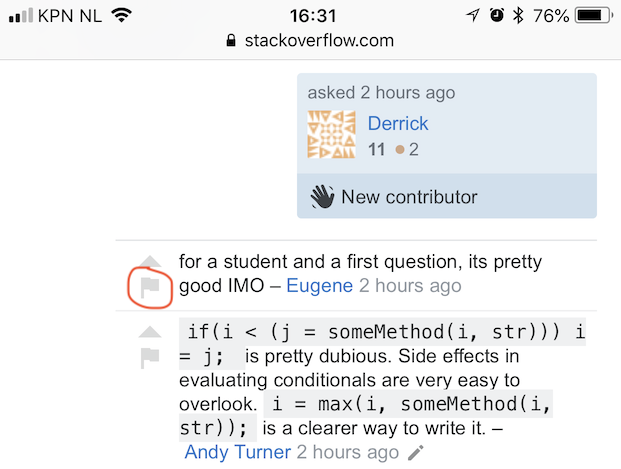 Browse other questions tagged feature-request mobile-web flags . How do I flag a comment for moderator attention? mobile site code formatting missing? Should we ban the author if there's spam/rude flags on his posts?